“Silver Threads,” is the fifth book in the Memory House series by Bette Lee Crosby. The Keeper of the Scales is in charge of the Scale of Life. It is held in balance by stones of happiness and sorrow. When tragedy strikes for the Bishop family, is seems like the scale is being offset by too many stones of sorrow. Drew and his daughter Brooke suffer a huge loss when his wife is killed. Trying to get their life back on track seems impossible. Seeking a fresh start, they decided to move. When they reach their new town, they find themselves at the Memory House. Even though it is no longer a bed and breakfast, the owner of Memory House found herself unable to turn them away. As time passes and their lives start to pick up, the owners and another temporary resident manage to embed themselves into the life of the family in a wonderful way. Behind the scenes, the Keeper of the Scales is weaving a silver thread into their lives that connects them to these people so that they can heal and move on. “Silver Threads” is the first book in the series that I have read and while it stands well on its own, I would like to go back and read the other books in the series because this story piqued my interest. Bette Lee Crosby does a beautiful job of creating characters that truly bring the story to life. Even if not all of them are likable, they are real. The Bishop family and the friends from their old home and their new home are all very special and there is definitely a magical feeling as everything starts to fall into place. I would love to read a future tale in this series that bring this wonderful family back into the picture, even if they are in the background. 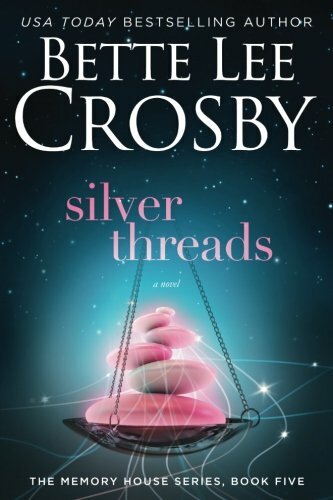 "Silver Threads" by Bette Lee Crosby is highly recommending reading. It is very unique and refreshing to read a story with so much heart. I believe this would be a great selection for a reader’s group. The story is very appropriate and can be enjoyed by all ages. I would definitely love to have been able to share my thoughts with others as I read it, and plan on recommending it to a local woman’s reading group.